Jesus The Radical Pastor: "Saved and Drawing Interest"
Years ago as a student in a well-known Bible school, I was being trained to do evangelism. Efficient evangelism. Clean, neat, tidy evangelism. Because big busy streets were near-by and because the part of the city we were in was somewhat of a slum at the time, bums and beggars were our favorite targets for evangelism. I was locked and loaded. I remember approaching one such bum and asking him, "Are you saved?" He responded with a grin, "Sonny, I've been saved so many times I'm drawing interest!" and he gave a hearty laugh. Grimey face, but dancing eyes. I remember being stymied, a little insulted that this guy didn't know the stakes; that he'd toy with something as valuable as his eternal soul. But I've learned that a cheap question really does deserve a cheap answer. That poor man's words came back to me recently as I was pondering exactly what is the gospel that Jesus announced, lived and died for and rose again to make a reality in this world. What if I had approached the man with "Have you been loved?" Or, "Have you had a decent meal today?" Or, "Will you tell me your story?" But, no. The man was not a person to me; he was a project; an assignment; a target. I had an evangelism model that allowed me to anonymously do a speedy Bible verse "hit and run" and swagger back to campus telling my friends that I had done it: "Shared the gospel." Jaded by the undoubtedly numerous times he had been "hit on," the old bum had developed a sense of humor. "Save me again, Sonny. Get your assignment done. I know it's not about me, but about you and your obsession to 'win the world.' Skedaddle back to the school and fill out your report." I wonder if when I face Jesus in the judgment, Jesus will point to an angel and say, "Remember, John, that Chicago bum with the really good sense of humor? That was him...there, the shining one. He really had a story to tell you. But you never asked." why oh why would anyone follow Jesus' own example of ministering to the lost? clearly we have a better way... and that way allows us to clearly pinpoint the exact moment that salvation occured so that we can move onto our next target (victim?). See the beauty behind the hit and run salvation is that it requires no follow up work. Just a pat on the back, a number for the newsletter, and another person with no dialogue partner for figuring out the christian walk. I think the more horrible ending to your story would not be to see the bum as a bright and beautiful angel in heaven... but to not see that bum in heaven at all. You're right...for him to be lost forever would be horrible. Similar flashback...I remember taking an "evangelism" class in seminary. We had a weekly assignment to "share our faith" with someone, fill out a report and get a grade. The whole thing felt weird to me (my paradigm was beginning to change even then). I went up to strangers at bars and bookstores. I enjoyed meeting new people, hearing there stories, getting out of my comfort zone, but when it came time to "stear the conversation toward Jesus for my grade, or close the deal" it all seemed shallow and inauthentic. I'm glad I chickened out most of the time. I sympathize with your reflections. I'm embarrassed by the models I bought into. While I'm thankful for my roots in the evangelical tradition with its emphasis on boldly proclaiming the gospel, I'm trying to learn HOW we proclaim such truth: how to embody it, how to enter the world of others, how to let the Holy Spirit guide the dialogue. I heard someone refer to counting conversations, rather than conversions. I like that measure better. Thanks for stopping by and recounting your experience with "canned" evangelism. On the other hand, I also see the incredible need for Christians to be engaged in communities like mine- especially young Christians, whose lives and worldviews are still much more open to being changed. So how do we do this? We have found that, done with intentionality, short term missions trips can be very effective. Is there a risk of doing it the wrong way for the wrong reasons? Absolutely, but it has been far better and more effective than not doing it at all. In the end, I love the wisdom of Jesus in the parable of the sheep and goats. He identified Himself as the poor, the sick, the foreigner, the prisoner, etc. This does two things for us: first, it requires from us more than hit and run (whenever possible, which is most often, but not always)- Besides, its Jesus! Who wouldn't stick around?- and second, as with ANY encounter with Jesus, we walk away richer for it, thus a "selfish" motivation, on some level, is affirmed. Let me put it this way: As flawed as your approach to that homeless man was, having had that encounter, are you changed forever as a result? By the grace of God, perfection of action and intention is not our ultimate goal. Great thoughts, John! Thanks. You are right...as I have reflected on that experience, I realize I am the one who needed changing (not to deny the man's need for salvation, however). My point is that I received a very trucated, extremely reduced mutation of "the gospel of the kingdom of God." Thanks for your very thoughtful reply. Blessings! 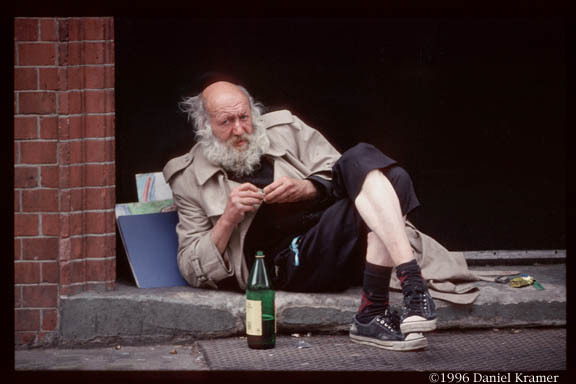 I remember my first evangelistic encounter with a homeless person. I gave him a tract and walked away real fast before he could ask me a question. We try to be somewhat subversive with our short term programs. Not sure if it is working, but I have a great deal of faith that it is. Thanks for putting out there what many in my field are afraid to address. Many of us have done just that. Thanks for stopping by. I have confidence that your ministry will prevail because of your heart for people. It's realy not the method most of the time, but we "carriers" of the good news. What a sobering post! Thanks for helping me think about the people with whom I come in contact. Wow. What a shake-up. I really feel terrible about making such a sweeping generalisation, but I feel so strongly about this I will anyway. Maybe what makes such hit-and-run evangelism possible is hit-and-run worship. Perhaps our efficient, clean, neat and tidy songs, skits and sermons have left God so worshipped he's actually drawing interest. I'm ready to sew my mouth shut! I've started blogging on your book at my site. Good stuff. Can I link to this? Yes sir, you may link to this post. I'm honored that you'd like to. Thanks, brother, for stopping by and commenting. Also, thanks for the kind remarks over at "Jesus Creed." I used to go a homeless shelter regularly to provide a worship service for the people there, and the pastor I sang with had an approach to the people I will never forget. He would always come down from the podium and talk to everyone on their level, and would say "I know that many of you know Jesus, and know Him very well. Just becasue you are poor and homeless doesn't mean you aren't saved, or that you are not allowed to have a strong personal relationship with Christ." And he would proceed to teach the crowd with as much dignity and meaty biblical substance as he would in a gathering in the suburbs. So often we approach the homeless as though they could not possibly be saved, because if they were surely they would have a home, nice clothes, etc. etc. It is true that many many need Jesus ~ but some need encouragement and strength in their faith! You have described an amazingly Christlike person. You must cherish those memories of him. You have shared some good thoughts here. Thanks so much.